Where Next For Kevin Magnussen? 5th October 2015. Kevin Magnussen was celebrating his 23rd birthday. But a good day very quickly turned into a very bad one when he checked his emails. He noticed one from McLaren team principal Ron Dennis’s personal assistant Justine Bowen. He was being told his services as McLaren F1 reserve driver would not be required in 2016 and his contract would therefore not be renewed. Even for the famously business orientated Dennis this seemed a very harsh move. Magnussen had grew up and developed with the team since he joined their young driver programme in 2010, reaching the pinnacle with a second place in his debut for the team at the 2014 Australian Grand Prix. 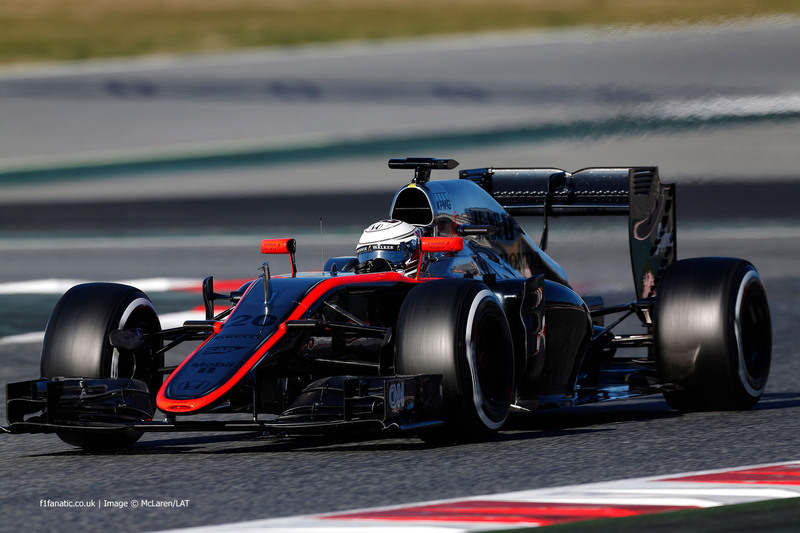 Magnussen showed well against experienced former world champion team mate Jenson Button. But then the big names became involved. Honda were partnering with McLaren from 2015 onwards, and very quickly Fernando Alonso fell out of love with Marco Mattiacci and Ferrari, rendering him suddenly on the market for 2015. This brought about a scenario which seemed impossible in 2008. Fernando Alonso would reunite with Ron Dennis and McLaren. This seemed impossible after their very bitter and public falling out in their first spell together in 2007. But I guess times change and money talks in F1, all of this leaving Magnussen battling Button for the remaining race drive for 2015. What followed was a very drawn out waiting game for both Magnussen and Button as months passed whilst McLaren tried to make their decision. Whilst it’s believed many in the team favoured the younger Magnussen, it appears at the last minute experience won out and the team announced their driver line up of Fernando Alonso and Jenson Button in early December. With very little time to find himself another drive in a competitive series, Magnussen had little other option than to accept the role of McLaren reserve driver for 2015, before finding a race seat for 2016. One thing was clear. Kevin Magnussen still wanted to race in 2015. He was in the advanced stages of securing a Indycar drive for the year so he could continue to race. Then Fernando Alonso got in his way again. In the later stages of pre-season testing Alonso mysteriously crashed his McLaren-Honda, and whilst the initial assessment was not a serious one, it was quickly discovered Alonso had suffered a concussion and was unlikely to make the opening Australian Grand Prix several weeks later. Magnussen was forced to end talks of an Indycar drive as he was called into action to replace Alonso in Australia. What followed was a hugely disappointing grand prix weekend where both McLaren drivers were plagued with issues surrounding the new Honda power plant. Magnussen qualified last and didn’t even start the race as his engine failed before the start to complete a miserable weekend for him and the team. Magnussen in pre-season testing for McLaren this year. His lack of racing would prove a huge frustration to him during the year. Photo copyright McLaren/LAT. Fast forward nine months and Magnussen is now looking for a race deal in 2016 after largely being sat on the sidelines for 2015. He came close to joining the new Haas F1 team for 2016 but lost out to first choice Romain Grosjean, and has recently tested for World Endurance title winning Porsche 919 for the team. Magnussen will surely be a driver high in demand for 2016 with his talents, it’s now whether he wishes to try and continue in single seater series such as Indycar/Super Formula or whether he changes tack and moves over to sportscars or GT racing. Surely Magnussen will get another chance in F1 soon, he’s too talented to only have one season at the pinnacle of motorsport. Only forces beyond his control can stop him. Yet where does the young Dane go from here? He’s looking to bounce back in big way next year after being an after thought at McLaren this year. Add the extra fire surely provided by the process of his dismissal from the team and he will be looking to prove a point next year. He was close to an Indycar drive this year, so could he cast his eye back to the series for next year. The only top line drive available appears to be the final Chip Ganassi Racing entry, a car he could seriously impress with next year. Should he take up this seat he would surely be a dark horse contender for race victories throughout the year. 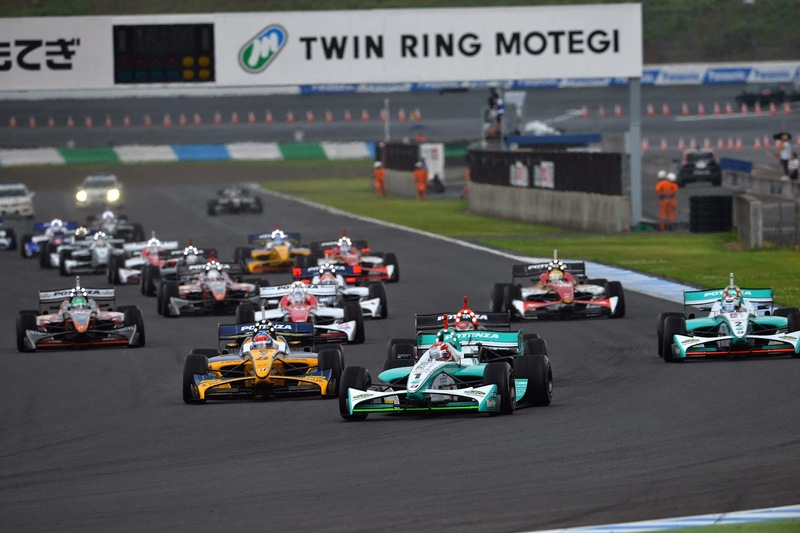 For now another possibility that hasn’t been ruled out is joining the Super Formula series in Japan. It’s highly competitive with a top quality grid which would keep Magnussen race sharp as he looks towards a return to F1. Whilst it will make it harder to gain the attention of Formula One in Japan, the series would be every bit as good as Indycar for him right now. Whilst nothing has been mentioned and it seems unlikely, it cannot be ruled out. Or could he be eyeing sportscars next year? The WEC is building in prestige and popularity every year, with an increasing influx of young single seater drivers making the move to become professional drivers. With the level of technology in the current leading LMP1 these prototypes are arguable more advanced than current F1 cars. 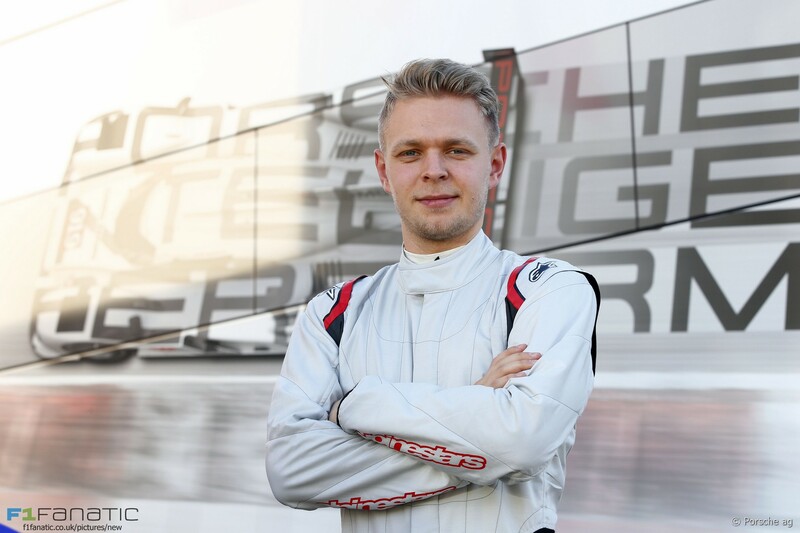 Magnussen posing before testing the WEC title winning Porsche 919 Hybrid at Barcelona. Will he be racing the car in 2016? Photo copyright Porsche AG. After testing the Porsche 919 Hybrid at Barcelona, he raved about the car calling it “the most advanced race car in the world”. Should the European Grand Prix in Baku remain clashing with the Le Mans 24 Hours, that would leave a seat available in the Porsche team for their warm up events and the 24 Hours itself. Porsche say their considering several drivers, could Magnussen be one of them? He would make a big impact for the Porsche team and would likely prove very fast in the WEC next year. The series would also be the perfect shop window for him to try find a way back into F1 when he feels the time is right. Porsche won both the championship itself and the marquee Le Mans 24 Hours, an opportunity to make your debut for Porsche contending for victory would be a dream for Magnussen. From here who knows where Kevin Magnussen will be racing in 2016. The only thing we know is that whatever he’s driving, he’ll be going flat out and racing at the front. Where do you think Magnussen will be racing next year? Let me know in the comments section and thank you for reading. 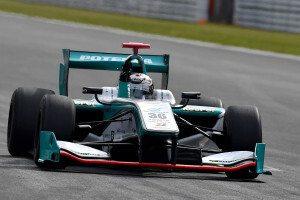 Immediately following the shock announcement of Max Verstappen joining Scuderia Toro Rosso for the 2015 F1 season on Monday night, rumours began circulating that for this weekend’s Belgian Grand Prix Caterham would replace Kamui Kobayashi with stand-out Audi sportscar driver Andre Lotterer. By Tuesday afternoon it appeared almost certainly a done deal, with the final confirmation being announced by Caterham in a press release this morning, Wednesday 20th August. For the insular world of Formula One many have started scrambling around for information and analysis on this very quick German, with the results they’ll find on him being enough to show his F1 debut this weekend is long overdue. Andre Lotterer has already been amongst the F1 circus once before, with early titles in German Formula BMW Junior and ADAC Formula BMW in 1998 and 1999 brought him to the attention of the new Jaguar team for 2000, who offered him several tests during the 2000 season to complement his 4th in the German Formula Three Championship campaign. The link to the Jaguar F1 team was made stronger in 2001 as he raced in British F3 for the Jaguar junior racing team, before stepping up to become the official test driver for the Jaguar F1 team for the 2002 season. 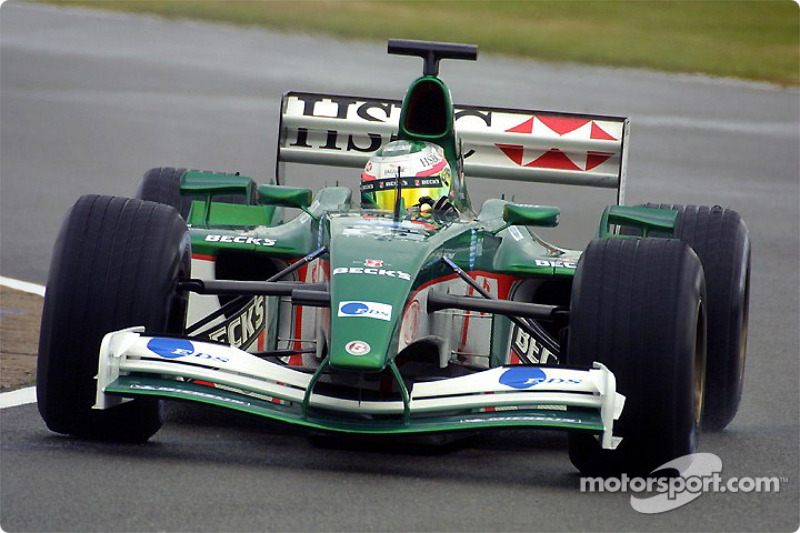 Lotterer testing for Jaguar in 2002. Whilst it initially looked likely that Lotterer would be promoted to a race seat in 2003 after it was announced that both Eddie Irvine was retiring and Pedro De La Rosa was to also leave. Sadly for Lotterer the team chose 2002 Minardi stand-out Mark Webber alongside promising young Brazilian Antonio Pizzonia for the 2003 season, leaving Lotterer looking to re-build his career momentum. Lotterer subsequently shunned Europe and went to Japan to race in their premier Formula Nippon series, now called Super Formula, and Japanese Super GT series for 2003. Impressive results in both cemented his reputation in Japan as a very fast young driver as he was a frequent title contender in Formula Nippon for the works TOM’S Toyota team, alongside two Super GT titles in 2006 and 2009. 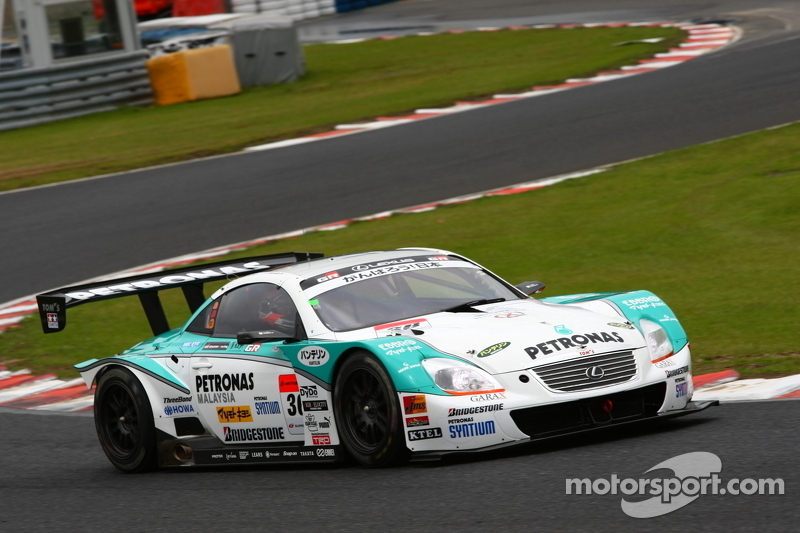 Lotterer and Kazuki Nakajima driving for Lexus in Super GT at Okayama in 2011. These impressive results in Japan led to some well deserved attention from Europe, although it does seem surprising looking back that despite consistently impressive Super GT results it took until 2009 for Lotterer to make his Le Mans 24 Hours. The call came from the Kolles team racing their privateer LMP1 Audi R10 TDI. After a herculean effort from Lotterer and co-driver Charles Zwolsman to complete the race without third driver Narain Karthikeyan to injury, the car came home an impressive 7th overall after completing 369 laps. The impressive debut with the Kolles Audi in 2009 led the highly successful works Audi team to offer him a deal for the 2010 season, where his Audi R15 TDI+ came home 2nd. From here things would get very busy for Lotterer as from 2011 onwards he would have to dovetail his Japanese Formula Nippon and Super GT commitments with a full schedule in the new Intercontinental Le Mans Cup, morphing into the World Endurance Series for 2012. The full time schedule has not affected Lotterer’s pace however as he finally claimed a first Formula Nippon title in 2011 after 8 years of trying, with a perfect 2011 being completed with a heroic first Le Mans 24 Hours victory for him, after fighting off an onslaught of Peugeot’s to claim the win. Things improved in 2012 as the Lotterer/Marcel Fassler and Benoit Treluyer partnership swept to a second consecutive Le Mans 24 Hours victory and the inaugural World Endurance Championship title also. 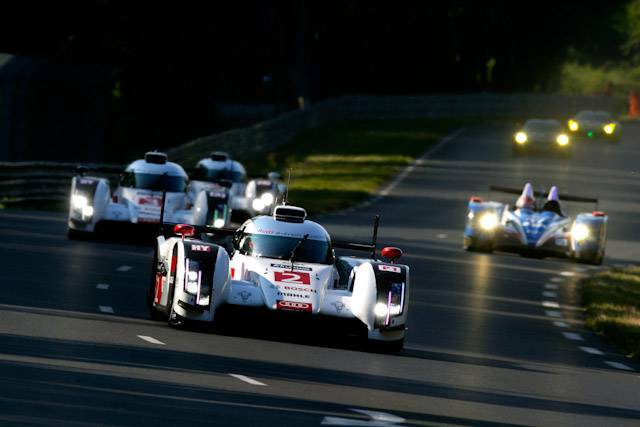 2013 and 2014 so far have seen a continuation of is stellar results as the Audi trio claimed a third Le Mans 24 Hours victory and currently sit 2nd in the World Endurance Championship with 5 rounds remaining. During his sportscar and single seater career so far Lotterer has regularly proven himself to be a master of wet conditions, which maybe gives some indication of why Caterham chose to give him debut in the notoriously wet Belgian GP at Spa. Another reason may be his experience of the Spa circuit this year as he’s already raced there for Audi both in the WEC and the recent Spa 24 Hours. Lotterer at this year’s Le Mans 24 Hours for Audi. Whatever Caterham chose they have made a bold yet good decision in my opinion to take a chance on the always quick Andre Lotterer for this weekend, as a sportscar fan I’ve seen plenty of impressive drives from him over the last few years for Audi. He has a chance to improve things for the Caterham team although despite circuit knowledge the Caterham car has proved very difficult all season. I sincerely hope he gets the chance to give a good account of himself this weekend despite the troublesome Caterham car, which I think is only fair after the wait he’s had to make his F1 debut. Photo credit goes to http://www.Motorsport.com , http://www.worldcarfans.com and http://www.autoindustriya.com please visit their sites for more amazing photos.